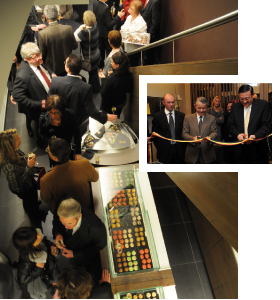 Official opening of the Chocolate Boutique of Pierre Ledent at Brussels. Prestigious event greatly honored and privileged to have the presence of the Ambassadors of Japan and China; the Minister for Employment of Brussels, Benoit Cerexhe and many other personalities, customers, suppliers and friends of Pierre Ledent. The opportunity was given to all to enjoy the specialties and to taste the quality and refinement of Pierre Ledent’s creation. Presentation of our autumn-winter collection of almond biscuits Macaroons. We offer following perfumes: pistachio, cinnamon biscuit (speculoos), coconut and tea.